Fort William - Travel by train - Fort William Station, Tom-na-Faire, Station Square, Fort William, Highland, PH33 6TQ. Glasgow - Fort William - Mallaig route. Staffed for all trains. Toilets. Car park including 1 disabled space. A taxi rank. Public phone. Jacobite Steam Train. Tel: 01524 737751. Fort William to Mallaig staem railway, passing over the Glenfinnan viaduct, which has been used in the Harry Potter films. Also see Fort William tourist and travel information. The Nevis Bank Inn is located on the banks of the river Nevis, 4 miles from Ben Nevis. Large rooms have en suite bathrooms, flat screen TVs and free Wi-Fi. Rooms are stylishly decorated using walnut wood furniture and luxury fabrics. They feature work desks and chairs, hair dryers and tea/coffee making facilities. Browns Restaurant And Bar serves classic and contemporary dishes using the freshest of local produce. The bar offers a fine wine list, real ales and a wide range of whiskies. The Nevis Bank is perfect for stunning countryside walks and the Nevis Range Ski Centre is 3 miles away. 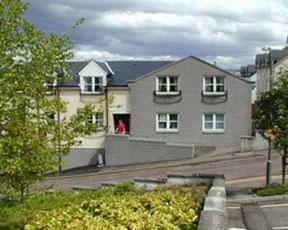 Fort William town centre is a10-minute walk from the inn. Free parking is available. The Imperial Hotel is situated in the heart of Fort William offering the best of accommodation, service and standards. All rooms are furnished to a very high standard with sea views also available. There are two bars and our famous seafood restaurant within the hotel. A holiday or stay to remember. Overlooking the shore of Loch Linnhe and with magnificent views of the Ardgour Hills, this Victorian guest house is just 5 minutes' walk from the town centre. A warm Scottish welcome awaits you at Ashburn Guest House, where proprietors Christine and Willie MacDonald will greet you with genuine Highland hospitality, traditional home cooking and 180 cm wide super king-size beds. There is ample free private parking and free broadband wireless access available. Other features of the guest house include a guest lounge and storage for luggage and bicycles.